Concert Band Is My Life, Teaching Improvisation Is My Job!!! Clinic Synopsis: There are many ways to alter Big Band charts to highlight improvisation; and the space created can sometimes be the highlight of the performance. We will discuss spaces in front of the chart, creating a vamp situation, and establishing a single chord vamp out of a complex progression. Also, there are countless ways to create using a single scale. This helps soloists get right to the act of creating by making two basic choices, a) what to use, and b) how to use what they choose. Clinician Biographical Information Baritone saxophone and flute artist, Denis DiBlasio, is director of the Jazz Program at Rowan University in New Jersey. He is also executive director of The Maynard Ferguson Institute of Jazz. 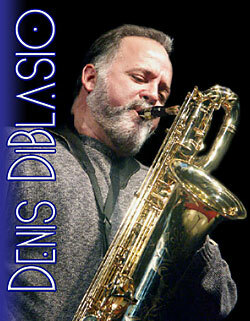 DiBlasio is known throughout the world as a Yamaha and Vandoren clinician, arranger, composer, and educator. DiBlasio says, "Have fun and don't let them see you teaching." Keeping things attainable and fun make up the foundation of his friendly approach.